Pauline Hanson, the recycled redhead is no different to recycled Rudd when it comes to stopping the boats. The Australian people were fooled by Pauline Hanson on previous elections when she secretly allocated preferences backfiring on the Borbidge Coalition in Queensland in 1998, on Howard’s Federal Coalition in 1998, and in 2001 preferencing against the WA and NT Libs. Hanson’s One Nation party is currently platforming publicly against illegal boat people flooding our shores and so to borrow Abbott’s catchphrase of ‘stopping the boats’. “It has been reported that 80% plus arriving by boat or plane don’t carry any form of identification. Some are given false passports to enter Indonesia which are taken back once they are in the country to use for the next lot and others destroy their documentation. If you are genuine why not prove your identity? Anyone arriving without paperwork immediately denied entry and sent back to their last known port before arrival or their homeland. Indonesia must be told that our foreign aid is on the condition that the illegal people smugglers must be stopped. People smuggling to carry a minimum jail term of 10 years, to be served in an Indonesian prison. The crew on the boats to do a 2 year jail term in Indonesia after negotiating an agreement. For those who are genuine refugees and not here for economic reasons are to be granted a temporary protection visa to be reviewed every 2 years. Depending on individual circumstances, to be sent back to their homeland if no longer a threat to their safety. Family reunion will not be available to those granted refugees status until such time that they may be granted permission to apply for Australian citizenship. This would not be available for a period of less than 5 years from date of acceptance as a refugee. Australians must be assured of good character, loyalty to Australia and not an ongoing burden to the taxpayer living on welfare. One Nation says it will grant refugees citizenship using the famility union route. Nice hidden deception between the lines. So don’t be fooled by One Nation’s electioneering antics! Green Labor has facilitated 50,000 boat illegals into Australian since Kevin 07. Of those, 30,000 are backlogged pending settlement in Australia. 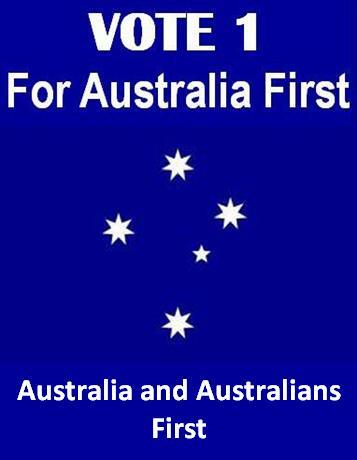 If Labor is re-elected, the 30,000 will be granted permanent residency and Australian citizenship, then phon etheir mates for family reiunion and more waves of illegals will continue to flood our shores. If the Liberal Coalition is elected, the plane loads will continue and undemocratic immigration will continue at a rate of 200,000 a year, so continuing to steal Australian urban jobs, homes, childcare, hospital beds. If One Nation is elected, refugees will be granted Australia citizenship. 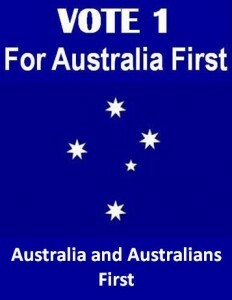 If Katter’s Australian Party is elected, immigration will continue to be be encouraged to increase Australia’s population because ‘growth is good’. Lookout northern Australia, if you think the south was too crowded…! If the Greens get elected, Australia’s borders will be removed, the Turd World invasion will enter its full phase, sparking sovereignty uprisings to erupt within months. No refugee immigration of any sort will be permitted. Immigration shall be prohibited via the asylum/immigration route. No temporary protection visas shall be allowed. Any person arriving in Australia demanding any sort of ‘asylum’ will be deported forthwith. Conditions for Australian Citizenship will be made considerably restrictive, including a minimum 8 year waiting period, minimum Year 10 English standards, financial independence, amongst other criteria. Australians will be offered a Constitutional plebiscite on immigration policy.